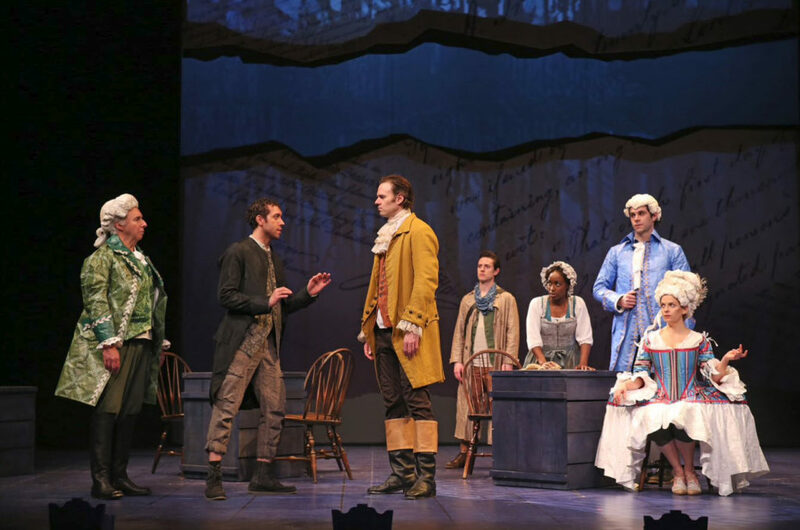 In Jefferson’s Garden, part of the exciting Women’s Voices Theater Festival, Wertenbaker’s focus is on the American Revolution and how we got there, revealing the contradictions between our founding father’s ideals and both the realities and precarious nature of freedom. It reminds us the it was considered either a revolution or an insurgency depending on who was doing the talking. Director Nataki Garrett opens the drama on a boat sailing from England to America, where Carl (Michael Halling), a bourgeois German aristocrat, meets a Quaker family who promise to take him to their farm if he learns practical skills. He does. Though the family are pacifists, their young son Christian (Christopher Dinolfo) defies his family to go to war, ultimately breaking a promise to his sister Louisa (Maggie Wilder) that he will never fight. Nine actors, in different roles through dizzying wardrobe changes, introduce us to many of the founding fathers – Thomas Jefferson, James Madison, George Mason, Ben Franklin, George Washington – as well as the soldiers affected by the cost of war on their lives and loved ones. 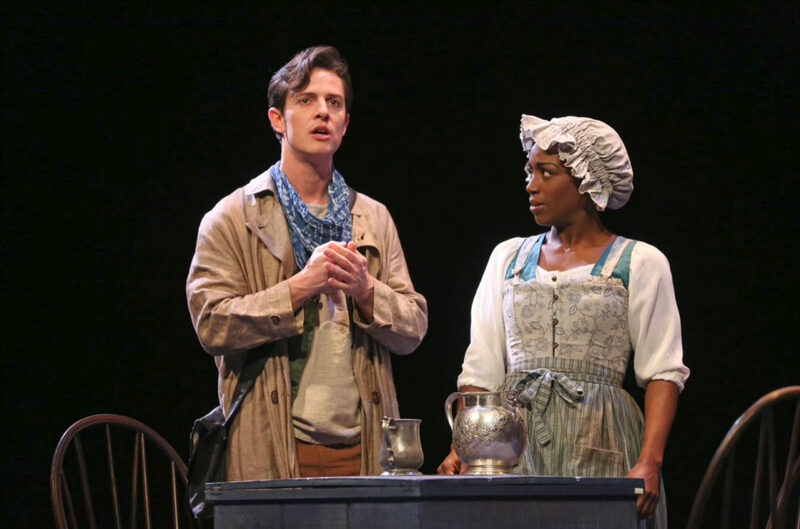 The character of the freed slave Susannah (Felicia Curry) and her love story with a white man lend insight into the struggles both sides faced. It is not until Act Two, that we come to Jefferson’s noted Monticello garden where the men have come to hash out the Bill of Rights and express their considered opinions. There under a gazebo, we meet bossy Southern belle, Nelly Rose, played hilariously to the hilt by Kimberly Gilbert. It is a high gear everything-but-the-kitchen-sink telling of the American Revolution – at times funny, at others emotional or flat-out educational. Who knew there were four million Americans and only 160,000 Brits at the time of the revolution? And who knew the King offered freedom to slaves who fought for England? Okay, you did. Seems I’d better brush up on my American history!Thoroughly enjoyable. Additional cast members – Christopher Bloch, Thomas Keegan, Michael Kevin Darnall and Kathryn Tkel. Through February 8th at Ford’s Theatre, 511 Tenth Street, NW, Washington, DC 20004. For tickets and information call 888 616-0270 or visit online. For more info on the Women’s Voices Theater Festival visit online.